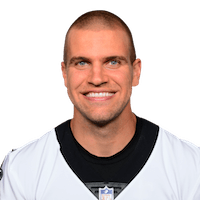 Published: Nov. 19, 2017 at 04:29 p.m.
New Orleans quarterback Drew Brees scrambles, finds tight end Coby Fleener for 35 yards. Published: Sept. 17, 2017 at 04:18 p.m.
New Orleans Saints tight end Coby Fleener stretches out for a 4-yard TD. Published: Sept. 11, 2017 at 10:07 p.m.
New Orleans Saints QB Drew Brees finds tight end Coby Fleener in the end zone for an 8-yard TD. Published: Nov. 17, 2016 at 11:41 p.m.
New Orleans Saints QB Drew Brees fits the ball between defenders to tight end Coby Fleener for the 8-yard TD.